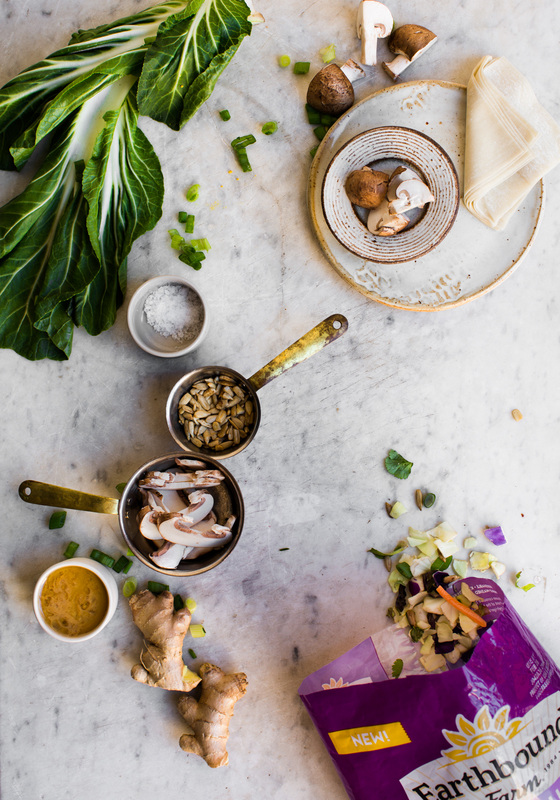 Filled with sautéed mushrooms and bok choy, these dumplings have an earthy aroma with a slight heat from the freshly grated ginger. 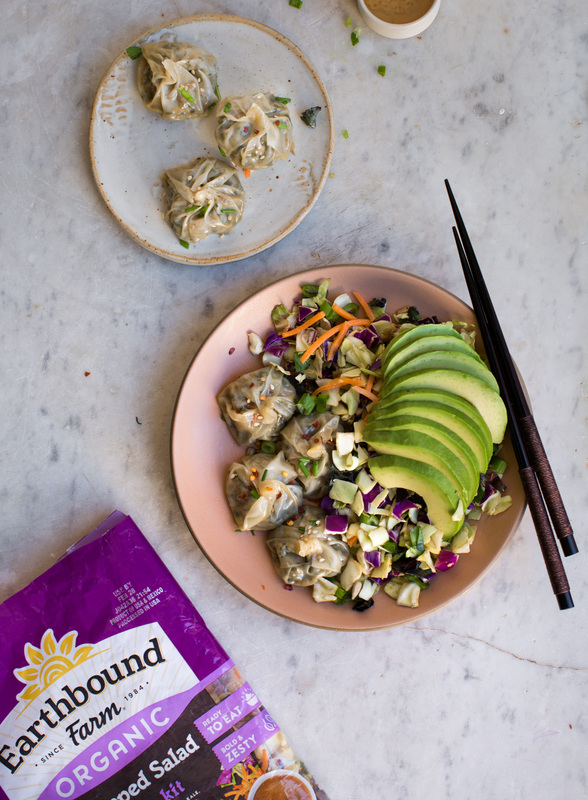 In attempts to keep dumplings on the lighter side, I’ve also paired them with this delicious Asian Salad Kit by Earthbound Farm! And since the dumplings are tender pockets of sautéed veggies, the salad offers a nice contrast in flavors and textures. Bites of crunchy kale and cabbage, and nutty sunflower seeds mingle with the delicate dumplings, while a drizzle of tahini dressing wraps the meal in a lovely sweetness. Now this is how I like to start my Sundays. Earthbound Farm has been committed to organic farming since they started back in 1984. The Chopped Salad Kits are one of the newest additions to their product lineup - and while I used the Asian Kit for this recipe, the kits also come in BBQ Ranch and Southwest! Be sure to check out their website to find them at your nearest retailer! This recipe was created in partnership with Earthbound Farm and FeedFeed. Thank you for supporting brands that support 8th and lake! In a medium-saucepan over medium heat, warm the oil and add in the grated ginger and garlic. Let this cook for a minute. Now add in the bok choy, a tablespoon of water and sauté with a pinch of sea salt for 5 minutes. Toss in the mushrooms, with another tablespoon of water, and sauté for another 5 minutes. Now add the sautéed greens and mushrooms, and the rest of the ingredients, except the wonton wrappers, into a food processor and blend for 10 seconds, or until the mixture breaks down and makes a nearly smooth batter. Depending on the size of your wonton wrapper, you will stuff the wontons with 1 - 2 teaspoons of filling. For this recipe, I used square wonton wrappers but any will work. Dollop a small amount of the filling directly into the center of the wrapper and lightly wet the wonton rim with water. Leave enough room around the rim to be able to lift the sides, pinching at the top. This is how you seal the wonton – creating a stuffed packet, pinched at the top. Now place your dumplings into your steamer basket and cook for about 8-10 minutes. While dumplings are steaming - prepare salad according to package directions! Place on top of the dressed salad and enjoy!